Description: By the time she heads out the front door, the modern woman has spritzed, sudsed, and slathered herself in more than 127 different chemicals, many of them more toxic than beautifying. So how can you look and feel great while safeguarding your health? Get smart and go green from head to toe with the help of eco-expert Gillian Deacon. 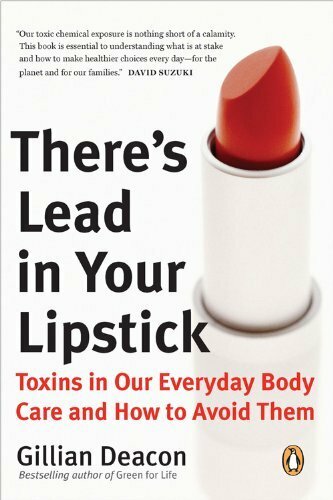 In The Green Body Guide, you'll learn how to read the ingredients to identify and understand the preservatives that are bad for your body and damaging to the earth, including formaldehyde in deodorant, nail polish, soap, shampoo, and shaving cream; coal tar in hair dyes; lead in lipstick; and many more. This is an indispensable handbook of personal-care choices that are sustainable, both for your health and for the earth. Earth day shouldn't just be an annual tip of the hat to greener living. This year, make it the day you recalibrate your everyday patterns to be more earth-friendly all year long. You don't have to be a treehugger to care about avoiding toxins in your everyday bodycare. Synthetic chemicals in personal care products contaminating groundwater and wildlife is alarming enough—but they’re also contaminating us. Those hard-to-read ingredients you squint at on the back of a product label? They’re building up inside your body and in your children’s bodies—on Earth Day and everyday. Make today the day you start paying attention to that fine print. Turn a product over and read the ingredients label before you are seduced by the “green” imaging on the package. The good news is, there are lots of safer products on the market. Good luck and I hope you’ll check out There’s Lead in Your Lipstick for more ideas on how to clean up your act! neck area, leaving on for about ten minutes. Award-winning broadcaster and writer Gillian Deacon brings her informed and friendly style to the subject that has long been her passion. A busy working mom and host of CBC-TV's The Gill Deacon Show, she understands the challenges of trying to "do it all" with a smaller environmental footprint. and an Eco Kiss kit from Saffron Rouge Retail value total is approx CDN $48.95. I'm so concerned about dangerous ingredients in the cosmetics I use every day. I'd love to win this book and the prize pack to help me make more informed decisions so I can stay healthy and lead-free! I would love to read this...what a great information source! I've only recently become aware of toxins in everyday products and this book seems like an interesting (and easy!) intro in helping to detox our house! I am always concerned about toxins in products and believe all that maybe cancer related. there are so many ways we push and test our bodies every day - why poison ourselves more than we have to. I'd love to learn more. I bought a new long lasting bright red lipstick the other day, I was so happy with it, until my daughter started telling me about all the lead it had in it. Yuck, I follow a fairly organic lifestyle and now I find my lippie is lead filled. I need to read this book. I would like to win a copy because I'd like to be able to make informed choices about the beauty products I buy. I'm also a teacher, and I'd like to pass on some of that knowledge to my students. Plus, my lips can always use more lip balm! Gillian's book will be a valuable resource for personal and patient use in my naturopathic medical clinic. Thank you for shining a light on this enormous issue! I recently learned of the dangers in our cosmetic products while listening to a radio show that Gillian was talking about her book on. I've just started revamping what I eat and didn't even think about looking in my medicine cabinet! Upon starting, I've come to see that it's a confusing task - just because it says 'natural' on the label doesn't mean that it's a green product! I don't think I can do this on my own - I need the help of an expert. This is why I would live to win a copy f Gillin's book. i am a health & beaut product addict, and i hate to think that a lot of what i use could be dangerous. also, i'm just getting into wearing & buying everyday makeup and i'd like to start off buying and using the best, safest products from the get-go! I have been using natural laundry and cleaning products for the last twenty years, but have not fully done so with facial and beauty products. Would love to learn more about them. Thanks for this giveaway! What is next, where were these lipsticks made is it the country that put lead in everything they made, I really wonder if America cannot make things for themselves, what really is their problem in such case. usage of? Can I am getting your associate link on your host?